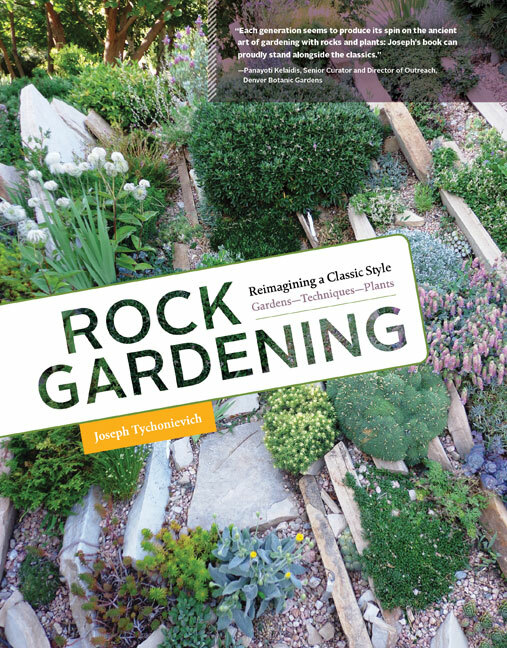 Prairiebreak: Why a rock garden? THIS is why! Why a rock garden? THIS is why! THIS is the view from where I took the LAST picture--beautiful from any angle! Where but in a rock garden can you grow the Trumpet Gentian so artistically and well? Lewisia tweedyi (or one of another half dozen generic names--just ask my buddy Mark McDonough and he'll tell you which one is current). The peony is grand enough--but so wonderful with the phloxes behind, the Iris 'Sprite' in front and the variegated I. pallida to the right...this is the magic of rock gardening in spades! Another glimpse, with a shrubby peony behind (not sure which one) and a perfect dwarf blue spruce sashaying up front! BETTER YET, Click on THIS URL, and you can sign up for the North American Rock Garden Society just in time to get the new seedlist put out by that group (with several hundred kinds of seed I sent them from my garden and collections included! )...NARGS is America's premier headquarters for plant nuts like you and me--and frankly if you've read this far you probably better belong if you're not a member already. I've been a member for over 40 years and lovin' it! You too will not regret it! Of course my first question is what's the soil mix below that handsome and nicely angular gravel mulch. I don't know why people get so upset when I get out my folding trowel and start digging in their gardens! (Actually I did do this each time we had to house hunt since I'm not buying houses but a place to garden). A man after my heart! I believe Ann has used a gritty "rock garden" mix--but the crevice gardeners who are going crazy around Colorado mostly using pure sand--to my horror! And they seem to be succeeding spectacularly: I'll be doing a blog about these "Sand/Crevice Gardens" soon--soil is the ultimate mystery. That and Trump's appeal to po' folk.. I'll leave it at that. Thanks for posting these beautiful pictures of my garden. Here is a bit about the soil and aspect. Obviously I did not follow the accepted rock garden guidelines for soil, much less the new sand craze. The native soil in this corner of SW Boulder is so rocky that it cannot be dug with a shovel. It is difficult even with a pick axe. I piled store-bought planting mix (top soil amended with compost and manure) on top; in some places it is several feet deep. There is a little bit of sand mixed in and the whole thing has been aging for 20 years. The rock garden is close to houses to the SE and SW. It gets no direct winter sun and some years will be under snow for months. In summer it gets half-day sun or more. Thank you so much, Anne, for adding that! Your post here may have hit an all time record for me--way over 1000 hits in little more than a day. Thanks for letting me "show" it--virtually! Super Fantastic!! I liked this post so much. you just made my day with this beautiful rock garden pics. Look at the colors of the flowers. and i really like the ideas of rock placements that you share here.